I recently had a 5kW solar array installed and it came with a Growatt 5000MTL inverter. This inverter is installed in my garage and comes with RS232 and RS485 ports for monitoring. I wanted to connect to PVOutput.org to publish my system’s production. I found a Python script that could do the job on sisand.dk but it needed an RS-232 connection via a TTY on Linux. 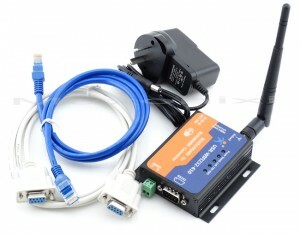 Because of the location of the inverter, connecting a device directly to the inverter serial port would be tricky. I could use a Raspberry PI with a USB serial adapter, but that seemed a bit icky and I already have a Linux box running WView to upload my weather station data so I wanted to use that box if I could. I found an inexpensive WiFi/Serial port solution on eBay and so now all I needed was some way to make the connection to Linux. Initially I tried socat, but this needed to be restarted each time I wanted to connect to the inverter and proved to be unreliable. A bit more searching revealed TruePort from Perle. This is a kernel module that bridges between a network terminal server port and an entry in /dev and although it is designed to work with Perle’s products, it works with any generic serial-port-on-the-end-of-a-TCP-port device. Getting it running required the usual Linux check-the-dependencies-recompile-the-kernel-install-the-mods drama, but once I got it running it has proven to be very reliable. When I look at the website of Perle I see a lot of devices. Which one you bought ? and for what price ? I didn’t buy a Perle terminal server, I am just using their free code. This is what I bought. It works well.